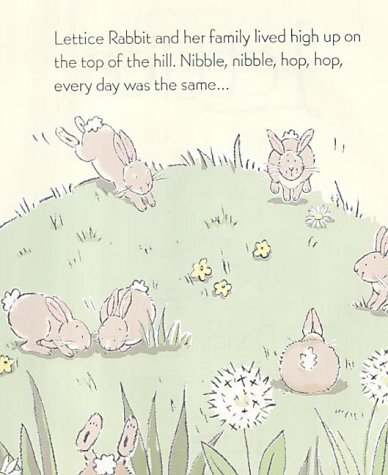 Lettice Rabbit decides she wants to be a dancer 'more than anything else in the world' and she leaves her comfortable hill top life with all the other bunnies for the town where she finds a ballet class. The teacher is amazed by Lettice's extraordinary jumps and she is chosen to star in the end of term show - but is she leaving ordinary rabbit life behind? This engaging debut picture book show a considerable flair for observation and characterisation - Lettice may be anthropomorphised but she is also very much a rabbit. Stanley makes versatile use of the page by including some delightful action sequences of Lettice dancing - there is a great feeling of vibrancy and joy in this little story. Events are also seen from a rabbit eye view with humans sometimes daringly chopped off below the waist - a device which serves to emphasis Lettice's smallness and fragility. Stanley's delicate pinks, greys and greens are printed on cream paper and her mannered, rather '50s style gives a delicious flavour to this very 'girly' book with its pink gingham endpapers and spot glitter cover.